I haven’t written in a long while (talk about breaking a New Year’s Resolution to blog at least once a week as I didn’t even make it the first week!). This has been due to both a crazy life and schedule and to some personal health challenges, but it’s time to get back on the horse so to speak, especially as Remy has now started to request to paint on his own. So, Autism Awareness Month gave me a good push to break out the laptop. This is going to be a different sort of blog with basically some of my musings and opinions, coupled with pro- autistic memes and images. I am not a “soapbox” type of person in general. Well, let me clarify that…. I have very strong, sometimes unwavering opinions, but I don’t usually air them publicly and instead preach to my like-minded husband. However, I have learned with having a child that you tend to fight for things that you generally would not have otherwise. I try very hard to respect people’s opinions and not judge them and I also feel that parents, with the exception of abuse, have the right to parent and make decisions as they wish. But, I do want to lay out my opinions, ones that were formed from countless research from all sides of a topic, so others can hopefully benefit from the information. This brings me to the Neurodiversity Movement that has been gaining popularity within the adult Autistic Community and their allies. Our family is an ally. What does this mean? It means that we value Actual Autistic opinions and mindset. Why? Only they know what it is like to live with neuro-divergent neurology. 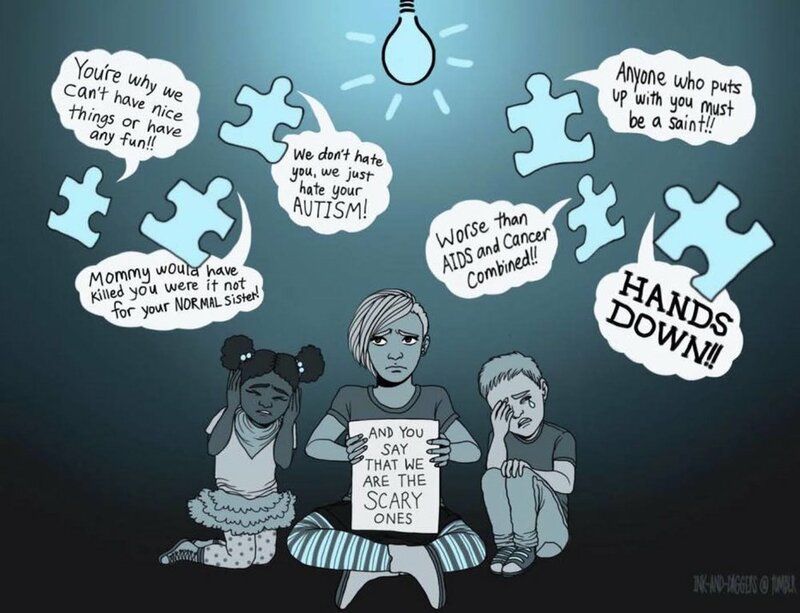 Opponents will say that because Autism is a spectrum that those adult Autistics who are speaking out are very different than the rest of the Spectrum, where people have challenges that are more severe. My thoughts? No one person is the same and this is especially true of Autism. The quote by Stephen Shore that says “If you’ve met one individual with autism, you’ve met one individual with autism” rings very true every single day. Now I wish it was written in a different language but I’ll get to that in a minute. However, if we don’t listen to the experiences of those that know what it is like to be autistic, how would we ever understand it? Countless people have written on the subject so I’ll leave it to them to explain further and move on. My intent is to mention our preferences so it may give some food for thought and a jumping off point for your own research. We use “Identity first language in our household and not “Person first language”. What does this mean in reality? Remy is Autistic. He is not “a person with autism”. Autism isn’t a disease, it can’t be separated from himself. Everything he does is colored by his autistic brain and no matter what awesome progress he makes in his challenging areas, this will never change. One caveat to the above is that every autistic person gets to decide how they wish to be addressed, regardless of how we may feel about it. So, just ask them! Everyone has their reasons for their choice of language as language is a powerful thing. If the person doesn’t realize that there is a choice, show them resources or explain it to them in developmentally appropriate terms. 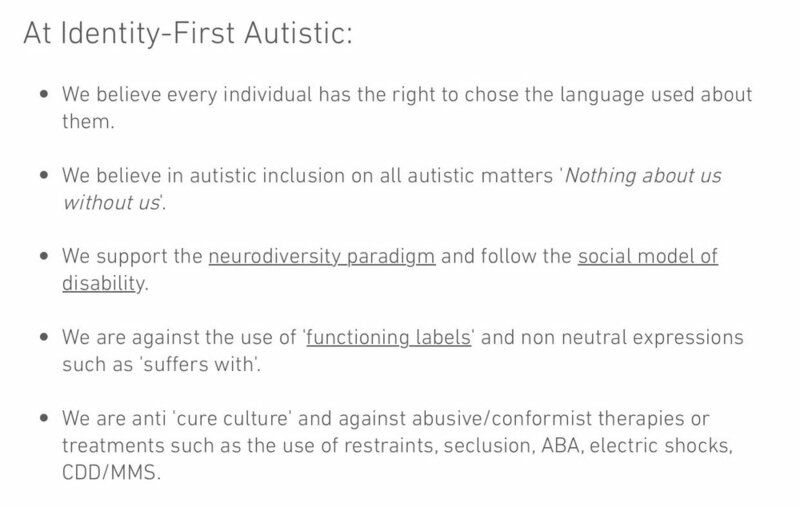 While there are those that may have co-morbidities and are not able to make that choice, we look to the majority autistic perspective and then aid them in reclaiming the word “autistic” by taking away its negative connotation. There is a website called “Identity- First Autistic” dedicated to this language, so I encourage you to take a peek. Actually, the website encompasses many things that we ascribe to in our family…. I was a person that very freely used the term “high” or “low” functioning when describing an autistic person and their capabilities and now, hearing it, makes my blood boil. Admittedly, it is hard at times to find the proper language to use but, as I said, words are powerful and the connotation of “functioning” is a harsh one. When we view Autistics for all the things they “can’t” do, how is that in any way positive? The Problems with Functioning Labels . In his piece, he talks instead about supports needed for the autistic person. The DSM-V, the current diagnostic manual we use in the USA, has the “Autism Spectrum Disorder” diagnosis and then broken down into a level system to give a general guide to the level of supports a person needs. The level system is very subjective and a person’s level can change over time. My go-to article to recommend to people is: “Making Sense of the 3 Levels of Autism”, by Lisa Jo Rudy. Despite the use of “functioning”, it is a great article in an easy to read format. I’ll note that we can’t always get around using the word “function”, but it is about not using it as a title or moniker when describing a person. This is a little two-fold as it also gets into the area of organizations who we support and who we do not to support. What is the first symbol you think of when thinking of autism? Now, what organization do you think of in association with that symbol? Well, if your answer is the puzzle piece and Autism $peaks (which I would expect from most), the later answer is why we are against the puzzle piece. Many have tried to reclaim the symbol for a more positive outlook but logos provide subconscious imagery and the negative connotation doesn’t go away. The idea that something is “puzzling” is filled with negative imagery and when you’re referring to someone’s neurology, it’s just plain offensive. The debate over its usage (Actually Autistic vs non-autistic parents of Autistics and professionals) is a common one, so much that there was an actual study done asking the question “Do puzzle pieces and autism puzzle piece logos evoke negative associations” and in short, they found that they did (have negative associations) and it should be avoided. Certainly click the link so you can read it for yourself! article from the Art of Autism. Last year, a flyer from school came home in Remy’s backpack saying that the school was going to celebrate World Autism Day by having everyone “light it up blue” and wear blue clothing. My hackles immediately went up and I honestly didn’t know how to respond as it was obviously too late to change their minds and the flyer went out to the 400 plus students already. So, what did I do? Well, I made my kid into a protest statement. I’ll admit that it wasn’t my finest parental decision but it was an important topic to me. I mean, come on, the flyer literally had the Autism $peaks logo printed on it. So off to the craft store, I went and I ended up making him a red shirt that had the hashtag #redinstead, which represents a campaign against the organization and the use of “male” imagery and the organization itself. Actually, a friend with an autistic child at his school agreed to wear a shirt as well, so he wasn’t alone in our protest statement. I also wrote an email to the Principal and the Vice Principal explaining my viewpoint. The VP was also the head of special education for the school and was very supportive. This year, she is now our Principal! That support carried over into action and she allowed me to come up with an alternative for this year. I will write about the specifics in a separate post but after it occurs, as they are having their own support day, coupled with their monthly community meeting so the children can get some education and connect it to why they are wearing certain clothing. In a nutshell, each class will be assigned a color or colors to wear for the day in support of Neurodiversity. Then the connection will be made that while every class was given the same instructions and color, the kids may have on different shades of that color or be unique in what they choose and that choice represents that while we are all people, we are all made up differently with unique attributes. Again, that's the quick version, but we hope that the impact will be powerful for the students and then we will have all the colors of the rainbow represented which embodies the rainbow infinity symbol that is used for Neurodiversity. Now this year, on World Autism Day, even though the school wasn’t officially celebrating on this day, I wanted Remy to honor it in some way. His shirt from last year has gotten a lot of use and is too small, so we had him wear His school colors which are in the red family. Will anyone know why? Of course not and he doesn’t understand the impact yet but he looked darn dapper and cute today! 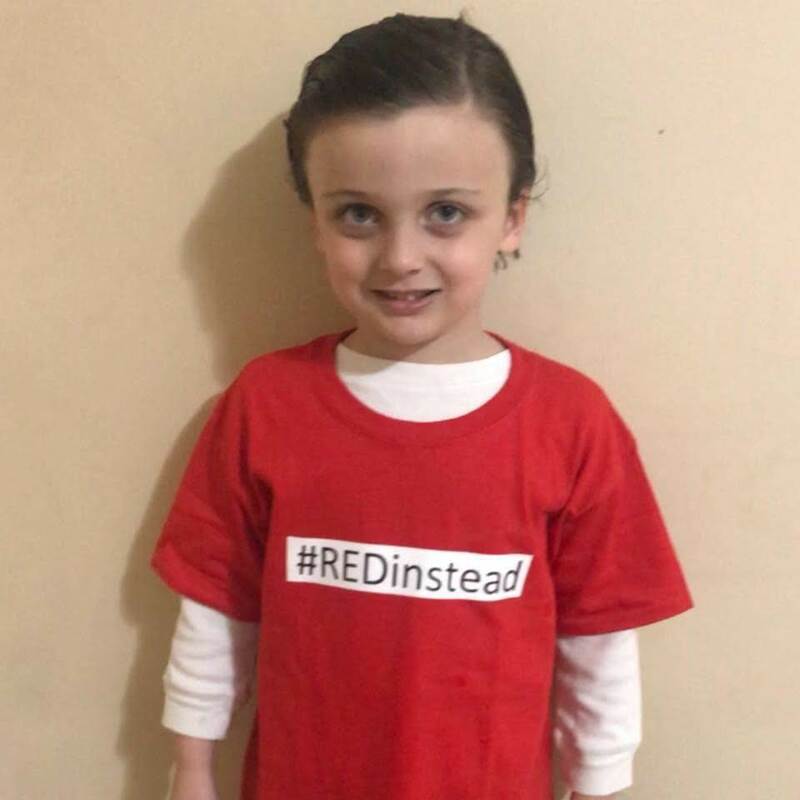 While he may not have worn his #redinstead shirt, his friend, Bradley, did wear his! So I was thrilled that the campaign was represented at school today. I am unsure of the original creator of this meme. If you are the creator and would like credit, please feel free to contact us. I am going to keep this short as the internet supplies endless opportunities to read about why we do not support organizations like Autism $peaks, The Autism Community in Action (TACA), formally known as Talk About Curing Autism and Age of Autism. And instead, focus on organizations I suggest that you should gear your hearts and minds to- organizations that aren’t looking for a “cure” for how a brain is wired. It’s not an illness or a disease to be cured or, in the case of the Age of Autism, a daily internet paper about the “Autism epidemic” (Jeesh it’s no wonder autistic adults are so mad when you need to read titles like this). I think these organizations recognize that a “cure” is unrealistic (as it’s ridiculous), so what it equates to is to find a prenatal test in order to identify an autistic person in utero and thus the parents can choose to terminate the pregnancy. Because of the backlash over the “cure” talk, Autism $peaks has removed it from their mission, and TACA changed its name. However, when you look at the agencies they support and where they spend their funds, it is very evident that they still very much support this research, but I digress. There are many organizations that are supported by the Neurodiversity Movement, Autistics and their allies. Only you can decide what organizations you are comfortable with but when evaluating where you spend your money, consider the language the agency uses, where the funds actually go to, how transparent they are about their budget and the overall mission of the organization. I have compiled a list of national and local organization that we support if you’re interested, which can be found here. I think I have thrown enough at you for one reading and your head may explode if I get into my views on therapies such as Applied Behavioral Analysis (ABA), so I’ll conclude for now. One thing that I think about when forming an opinion or a stance on an issue, is how that stance makes me feel in my gut and then also research all sides of an issue. To me, it makes sense to listen to actual autistic individuals and their viewpoints on how things make them feel, over what a non-autistic professionals happened to come up with, even if they were well meaning. We have a long way to go in changing language culture and societal expectations for autistic persons, but we are on our way. It’s up to everyone to embrace people differences and provide appropriate supports for our autistic family, friends and neighbors. If you want to learn more about ways to support the autistic community during Autism Awareness Month or support to be supportive of the Neurodivesity Movement, below are some great articles to read.